With medic alert systems you can be assured that you will get the emergency help you need, even if you can't speak for yourself. Bracelets or necklaces help you when you are away from home, while in-home systems protect you at home. To be comfortable with day-to-day living, you need to feel sure that you will get the help you need in an emergency and that those helping you will know your medical history. A medical condition or accident could keep you from being able to speak for yourself. You might be alone when the emergency hits. Or, you may be out with friends or loved ones that don't know your medical history. Even if your medical emergency happens with a group of senior service providers around you, they won't know your medical needs if you can't speak for yourself. Medic alert systems are designed to give people the independence to be alone and still feel assured that they can get help in a medical emergency. The systems are based on having a personal record that you set up with your medical and contact information. When there is an emergency, the information can be immediately accessed and read to emergency personnel who are treating you. Bracelets, necklaces and watches - These are engraved with your medical problem. Your personal health information is either on a wallet card that you carry with you, or online and accessible by toll-free number for emergency personnel to call. An in-home two-way speaker system - This is a small piece of equipment that is placed in your home. The equipment is hooked up to a response center that has access to your personal health information with trained staff who can call emergency personnel to your home if necessary. The personal health information could include medical issues, prescriptions, drug or food allergies, medical directives and emergency contact names and numbers. 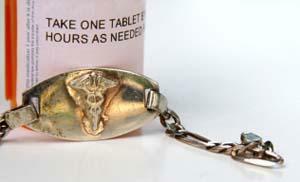 The key medical information is engraved onto an emblem attached to a bracelet or necklace. The emblem is engraved with a medical snake insignia, called a caduceus. Some systems engrave the member's identification number on the emblem along with a toll-free number that can be called 24-hours a day, 365 days a year to retrieve the medical information. It is standard protocol for doctors, nurses and first responders to look for a medic alert bracelet or necklace before administering emergency treatment. These in-home monitoring systems provide seniors and people with limited mobility with a way to call for help in an emergency. The system includes two speakers that provide instant voice contact to a central response center. One speaker stays in the house and is about the size of a telephone. The second speaker is a transmitter attached to a necklace or bracelet. Call out, and the central response center attendant will hear them through the in-house unit, respond back and talk with the person who needs help, and then call emergency services if necessary. If the individual does not respond, the attendant will call emergency services. Press a button on the necklace or bracelet. This will send a message to the central response center. An attendant will call out to the person who pressed the button through the speaker in the in-house unit. If the person needs help, or if the person does not respond, emergency services are summoned for the individual. Some companies provide both the emblem-based system and the in-home medic alert system. Some only provide one type of system. The key is to find a provider that is likely to stay in business and be available if, and when, you need them. Look for a company that has been around for a while and has a good track record of providing emergency information. This won't guarantee the future, but it will show that they have the knowledge and resources to give you the support you might need. The MedicAlert Foundation was founded in 1956 as a nonprofit membership organization with over four million members. It is headquartered in California and has international offices in nine countries. Their primary service is to store the health information of their members and then provide that information to the member, families, medical providers and first responders if requested during an emergency. They also alert contacts specified by the member of the emergency. MedicAlert's Emergency Response Center is available by phone daily, 24-hours a day. They use the international Language Line service which gives them the ability to provide information in over 140 languages. MedicAlert provides bracelets, necklaces and dog tags, as well as an in-home medic alert system called Health Watch. The MedicAlert membership cost is $39.95 to join and $25 each year thereafter. The bracelets and necklaces are priced from $9.95 up, based on the size and metal of the emblem. The Health Watch in-home system has a monthly monitoring fee of about $1 a day based on the equipment you choose. There is no contract and no cost for the equipment and pendent. Philips Lifeline is a for-profit medic alert service with a staff of over 250 multi-lingual people in their response centers. For over 30 years, Lifeline has provided medic alert service to members of the Visiting Nurse Associations of America, thousands of leading hospitals across the country and through select chapters of the American Red Cross. Lifeline provides an in-home system. There is no membership cost. The monthly monitoring fee is about $1 a day based on where you live and the equipment you choose, with no contract and no cost for the equipment and pendent. American Medical ID is a for-profit corporation founded in 1994. Their offices are in Texas. Their primary service is to store health information of their members on their online medical registry, which can be accessed by phone or online 24-hours a day, seven days a week.American Medical ID provides bracelets, necklaces, dog tags and watches. They are priced based on the size and metal you choose starting at $21.95. There is no membership cost. 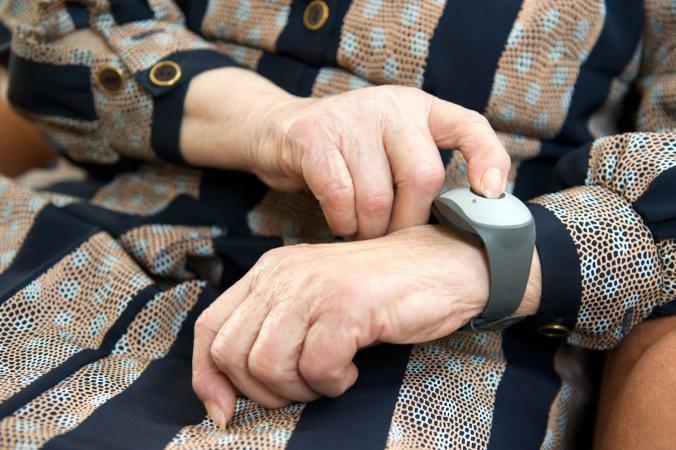 An alert system is a wise investment for seniors and caregivers alike. It provides a real peace of mind. In addition to the system itself, give your loved one a special gift of a personalized I.D. bracelet or wallet card from Things Remembered.